Please join me in welcoming Dr. Jorge Cortes to MCG and to the Georgia Cancer Center. Dr. Cortes, deputy department chair in the Department of Leukemia at MD Anderson Cancer Center in Houston, joins us Sept. 1. As we talked about last time with the selection of our new physiology chair Dr. Dave Mattson, there is a wonderful peace in feeling that the right individual has been put in the right job. Dr. Cortes’ professional accomplishments coupled with his deliberative demeanor clearly make him qualified to serve as cancer center director. He has one of the highest H-indices I have ever seen because he has been such a prolific investigator and publisher of impactful work, primarily aimed at improving leukemia treatment. He has directed studies that have led to the approval of new treatments, like the tyrosine kinase inhibitor bosutinib. But like the best among us, he is humble about what he has done and inspired by what we can do here together. Dr. Cortes says that he very much liked what he saw in the individuals and their commitment here, and the sense of ownership between the community and the Georgia Cancer Center. Like so many of you, he wants most to serve those who most need serving, because it is our responsibility and ultimately it gives us much in return. He too believes that patients are at the center of everything we study, teach and do. I want to thank all of you for your patience in finding the right individual. I specifically want to thank other key leaders including Dr. Dan Albo, Dr. Sharad Ghamande, Dr. Anand Jillella and Dr. David Munn for their insight. Like Dr. Cortes, they are the kind of people and professionals we want and need looking out for patients and for MCG. I also want to thank again the Georgia Research Alliance for its partnership in this important recruit. Dr. Cortes and his family will be with us for a few days starting this weekend so if you would like to meet him, there will be a meet and greet from 4-5:30pm Monday, March 11, in the Knox Foundation Community Room, CN1209, of the M. Bert Storey Research Building. Please know that we also are making great progress in the search for chairs of the Departments of Medicine and Neuroscience, so please stay tuned. We hope to be making announcements on those in early spring. Every great new treatment starts with both a need and good basic science work. I want to congratulate as well Dr. Dave Blake, neuroscientist in the Department of Neuroscience, for his diligent efforts to find an effective therapy for Alzheimer’s disease. Dr. Blake and his research colleague Dr. Christos Constantinidis, professor of neurobiology and anatomy at Wake Forest School of Medicine, have been awarded a $3.84 million grant from the National Institutes of Health to continue to pursue the potential of deep brain stimulation as a way to enhance working memory in the face of devastating cognitive decline. We have reported on Dr. Blake’s work in the recent past that showed, for example, several months of intermittent deep brain stimulation – as opposed to the constant stimulation used for patients with Parkinson’s – of the nucleus basalis of Meynert, a brain area that degenerates fastest in Alzheimer’s, enabled nonhuman primates to remember things up to five times longer. Now he and Dr. Constantinidis are looking at the impact in an older model, which experiences similar cognitive decline with aging as humans. By stimulating the brain, deep brain stimulation increases the firing of the synapses between neurons and the release of the neurotransmitter acetylcholine that enables brain cell communication. Dr. Blake wants to turn back the hands of time for the brain and we want him to continue to succeed. You know I love talking about the tremendous impact of our graduates and our faculty. Dr. Brian Stansfield is another great example of both. This neonatologist, faculty member in the Vascular Biology Center and 2004 MCG graduate, has just been elected president of the Southern Society for Pediatric Research. Dr. Stansfield definitely dances on both sides of Laney Walker Boulevard by taking care of our smallest patients and by doing basic and clinical research to improve the health of children. In 2017 and again last year, the Southern Society for Pediatric Research honored him with its Young Faculty Award. Glad to say that we did the same last year with the Outstanding Young Clinical Science Faculty Award. Dr. Stansfield also was just awarded a $2.2 million NIH grant to further explore the role of inflammation in retinopathy of prematurity, a common condition in the babies he treats that can result in a lifetime of vision problems. Congratulations and thank you on many fronts, Dr. Stansfield. While Dr. Stansfield was being elected society president, there were 27 abstracts from MCG and AU being presented at the annual meeting in February in New Orleans. What a great showing. Second-year student Laura Rodriguez, who studies with Dr. Norman Pollock, bone biologist at the Georgia Prevention Institute, was a finalist for the society’s Clinical Science Young Investigator Award, the highest honor the society gives to young investigators, and which Dr. Stansfield won in 2016. Her classmates, Rabeea Ahmad and Upasana Chandra, and third-year pediatric resident Dr. Stephanie Komic all received Trainee Travel Awards from the society. Our students and Drs. Komic and Stansfield are living proof of why MCG is known to educate the best physicians ever. Finally today, by this time next Friday there will be still more evidence that MCG is exceptional at educating doctors. Match Day 2019 will pretty much be over by then, except for the celebrating, because our students consistently do so well wherever their goals may take them across Georgia or the nation. 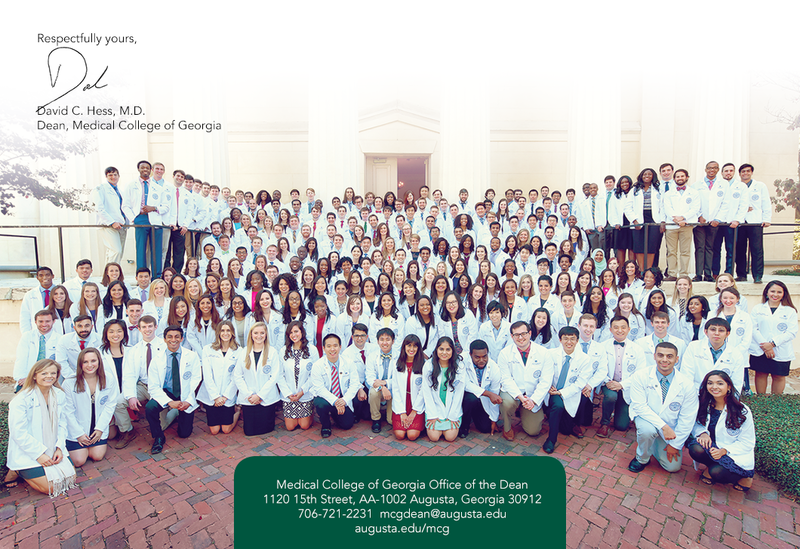 This year we have 241 students participating in Match, the magic moment across the nation where senior medical students learn where they will be doing their residency. I have to footnote here that it was Match Day that brought me from the University of Maryland School of Medicine to MCG and once again (most days) I could not be more grateful. Match will be held in Augusta at the Maxwell Theatre on the Summerville Campus and at George Hall on the Health Sciences Campus at UGA for seniors at the Partnership campus. Match Day festivities in Augusta will be livestreamed atwww.augusta.edu/stream. Today – Second Look, sponsored by the Office of Student and Multicultural Affairs, brings accepted URM applicants back to campus to spend time with SNMA and other medical students, network with our underrepresented minority administrators and faculty, learn more about our 6-week summer pre-matriculation program, hear about and see firsthand housing options on campus and in the Augusta community, and much more. March 15 – Match Day, noon, Maxwell Theatre, Summerville Campus in Augusta and in George Hall on the Health Sciences Campus of UGA for the Partnership campus.